I tried to keep this in mind when presenting the Mayor’s Civic Awards at this year’s packed Annual Town Meeting. The awards are traditionally given to local people who have made a positive difference in the community. After considerable thought I went for five unsung heroes who I felt have provided inspiration to Frome in quite different ways. 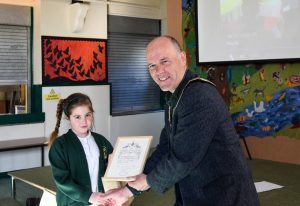 Eleven-year-old Isla Stockdale Coates began an anti-bullying campaign, which resulted in a march by over 400 pupils from 11 local schools helping to raise awareness about good behaviour. In contrast, Ron Stone, who turns 100 this year, served in the 44th Royal Marines Commando before returning to Frome and working for many years at Butler and Tanner. He is featured in the Working Memories Frome project and treated the room to a song he made up when he was based in Burma during the war about missing Frome. Karen Stewart received her award for being an active member of the Frome community. She is chair of Trinity Community Group, a trustee of Fair Frome, a lead on the Access for All campaign, and a presenter on Frome FM’ s On-Air Book Group. Bob Morris is chairman of the Frome Festival, now in its 19th year. A much-anticipated highlight for the town, each year the Festival showcases talent across the arts alongside global superstars, as well as bringing new visitors to Frome. 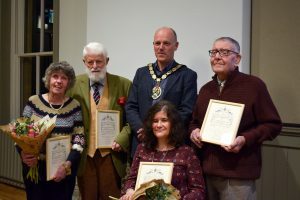 Marjorie Morris is the leader of the Society of Disabled Artists’ Frome branch, a member of Frome Save the Children and the sponsorship team for the Frome Festival. Five very different but fantastic individuals – thank you so much!